Confirm the value given for the kinetic energy of an aircraft carrier in Table 7.1. You will need to look up the definition of a nautical mile (1 knot = 1 nautical mile/h). This agrees with the textbook data in table 6.1. Wikipedia article about the Long Ton traditionally used for describing the mass of ships. This is College Physics Answers with Shaun Dychko. In this question we're going to verify the kinetic energy of a battleship. The trickiest part of this question is dealing with the unusual units. So we're told the battleship has a mass of 90 thousand tons but the word tons is a bit ambiguous. Usually in everyday speech a ton would mean 2000 pounds when it's written this way anyhow. A ton with two n's and an e on the end would be a metric ton but that's not what this is. This is with just t-o-n-s. When you see the word ton written this way it can actually have two meanings, one being a short ton which is 2000 pounds, and another being a long ton which is 2240 pounds. 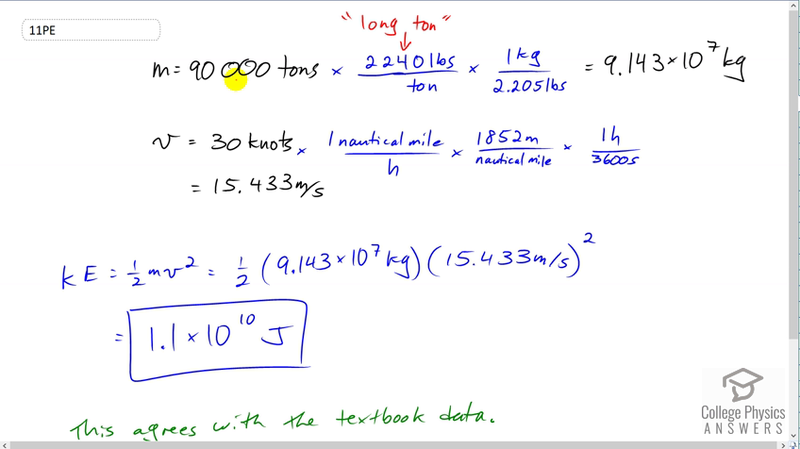 A long ton is what we're assuming here because that's the type of ton used for ships and the Wikipedia article on the long ton describes the other things that are usually measured with long tons like you know, bulk goods like sulfur or baled commodities and so on, but not very many things. But ships are one of the things that are measured with long tons. Okay. So we multiply the 90 thousand tons by 2240 pounds per long ton times, by one kilogram for every 2.205 pounds, giving us 9.143 times ten to the seven kilograms. Now the speed of the battleship is 30 knots and we're told that a knot is one nautical mile per hour and a nautical mile is defined as 1852 meters for every nautical mile. Then we multiply by one hour for every 3600 seconds so that everything cancels out except for the meters and the seconds. I could have written this as a compound fraction like one nautical mile per hour for every knot and then the knots would have canceled as well. Okay. So we have 15.433 meters per second. Now, we have our units sorted out and so we can plug in this data into our kinetic energy formula, one half mass times speed squared. So that's one half times 9.143 times ten to the seven kilograms, times 15.433 meters per second squared, giving us 1.1 times ten to the ten joules of kinetic energy when this battleship is moving at that speed. This agrees with the data in the textbook which also is 1.1 times ten to the ten joules.